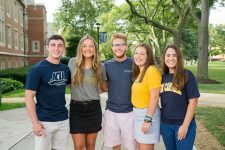 This early acceptance program reserves up to 10 seats for JCU grads (Ohio residents). Learn more. This early acceptance program reserves up to 20 seats for JCU grads in medical, dental, and pharmacy programs. Learn more. Two seats per year in Ursuline’s Accelerated B.S.N. Program are reserved for JCU grads. Learn more. Biology majors interested in nursing as a career may choose to enter a cooperative program in pre-nursing/nursing and earn the Bachelor of Science from John Carroll University and the Master of Nursing, Master of Science in Nursing, or Doctor of Nursing Practice from Case. Learn more. This dual-degree program blends in-depth knowledge of humanities and social sciences with a strong, technical engineering perspective to provide you with the perfect opportunity to customize your career path. Get a JCU bachelor’s in three years and then finish a second bachelor’s in engineering at CWRU after just two years. Learn more. Reduce the number of years it takes to get a law degree through our exclusive partnership with CWRU. Learn more. This high-profile program for science, engineering, and tech entrepreneurs reserves two spots each year for JCU grads. Learn more. Qualified psychology or sociology and criminology majors are able to enroll in the M-SASS program after their junior year at John Carroll. Successful completion of this two-year program results in a B.S. in Psychology or B.A. in Sociology and Criminology from John Carroll and a master’s in social work from Case Western Reserve University. Learn more.